Initially I wondered how I was going to handle this book. I had visions of pages filled with the bitchiness of office gossip. The he said, she said, they did world of female office staff with nothing better to do. How wrong I was. The Other Side of the Ledger has a story for everyone. Humorous at times yet thought provoking, it is an easy entertaining read. 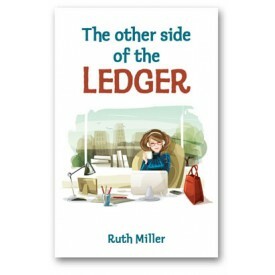 The Other Side of the Ledger is full of real life stories that take you on a different journey through the corporate world and the thoughts and actions of the female staff that keep the cogs turning. From office friends and affairs, to working around family life, traveling abroad and the balance of life, love and loss of employment, The Other Side of the Ledger has it all. It speaks of the reality of the day to day grind of office workers in a light hearted and fun manner. It is obvious that Ruth Miller knows the world of the working woman and the office. The Other Side of the Ledger is written with professionalism, style and truths of the working world. Ruth has not held back but allowed the reader to take a step in the door of each individual office scenario, taking them through the motions, emotions and hustle and bustle that each day brings. When reading The Other Side of the Ledger I laughed and I related. Having worked in an office myself I could all too well relate to the squabble, cat scratching drama that embraced a group that too often competed against each other. Of course there is also the love, friendship and goal driven desires. One thing that did leave me wondering about this book is the use of a subtitle underneath each chapter (short story) title. As I reached each chapter I would scratch my head trying to work out the reason why this was done, going back to the previous to see if I was missing a link between the two. Have I missed something that may be a vital part to the book? Each subtitle starts with the prefix 'un'. There is undulating progressions, unintentional indiscretions, undiminished services, undeniable ineptitude, unacceptable hypocrisy and the list goes on. By the end of the book I was all 'un'ed out. These subtitles set the mood for each chapter and as I became irritated by the 'un' I became a little annoyed with the book. I found each story spoke for itself, subtitle not needed. Overall, I was impressed with the feel and presentation of this book. The cover is glossy and smooth, feeling soft to the touch and pleasant to hold. The presentation is plain and simple but clearly gives a visual cue of the topic within. It leaves one with enough information to set the scene, invoking an inquisitive mind which leads to reading the back blurb and turning the pages. If only all of life was as simple, plain and entertaining as The Other Side of the Ledger. So did The Other Side of the Ledger weave its magic spell and keep me enthralled, amused and wanting more as it claims. I do not know about weaving a magic spell as such or keeping me enthralled but it kept me amused, entertained me and held my attention enough for me to continue to read from front to back. It was a non threatening relaxing read that allowed me to remove myself from the grind of my own life and take myself into the world of others. The Other Side of the Ledger is a book that every woman, from all walks of life would understand and enjoy, after all what woman doesn't like a bit of gossip.